A debate has been raging for decades (but especially over the last 10-15 years since the Atkins diet gained worldwide popularity) about whether or not a low-carb diet has a “metabolic advantage” over other nutritional strategies. A number of years ago I interviewed Anthony Colpo about this issue. He strongly disagreed with it. I have a lot of respect for Anthony and don’t necessarily disagree with him, but I’ll comment more about it below after I tell you about this study . It was funded by the National Institutes of Health to find out if the TYPE of diet people went on made any difference in terms of weight loss or maintenance when calories were exactly the same. Scientists took 21 obese subjects, aged between 18 to 40, and had them first lose 10% to 15% of their total body weight (an average of around 30lbs). IMPORTANT: All 3 diets were isocaloric i.e. they contained the same total number of calories, only the macronutrient ratios were different. 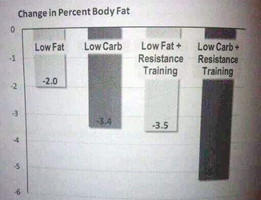 The low-carb group burned an extra 300 Calories a day than the low-fat diet. Even the Low GI diet burned 150 more Calories than the low-fat diet. Considering the participants underwent medial and metabolic testing, this would seem to suggest a metabolic advantage to low-carb diets. 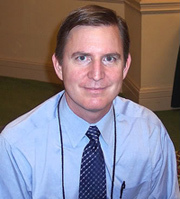 Dr. Eric Westman, of Duke University, certainly seems to back the idea of a metabolic advantage to low-carb diets saying.. Personally speaking, I have experienced better weight loss with a low carb approach. Many other people report the same result. However, total weight loss is NOT my primary concern. Changing body composition IS. More lean mass and less fat mass is the ideal result. When it comes to this, there is no doubt that a lower-carb approach works best. I cite several studies demonstrating this in my fat-loss book Total Six Pack Abs. It’s a matter of being in fat-burning mode, and out of fat-storage mode. Ensuring that you create an environment inside the body that encourages fat burning is about controlling levels of the hormones insulin and leptin. Controlled levels of insulin are like the gates to your fat cells being opened. 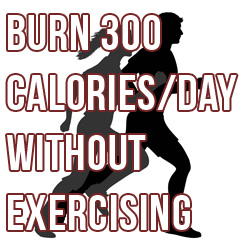 The fat can then freely come out and be burned for energy. Optimal leptin sensitivity allows your brain to signal that it’s ok to lose fat and that your body doesn’t need to start storing the energy that’s coming in (food intake). All of this is achieved by lowering carbohydrate intake, and especially your sugar intake. It doesn’t need to be very low in carbs. And for us lifters, there should also be periods of high carbs to replace lost glycogen in our muscles. Jeff Volek has done some great research on this very topic. See graph to the right and this meta-analysis paper called ‘Low-Carbohydrate Diets Promote a More Favorable Body Composition Than Low-Fat Diets’  for the in-depth results. 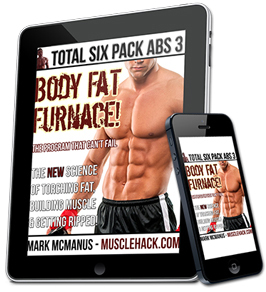 This approach simply produces more fat loss AND improves overall body composition. HERE’S THE TAKE HOME MESSAGE: Whether or not there’s a metabolic advantage to low-carb dieting remains debatable. However, don’t concern yourself with this issue. What you really want is less body fat and more muscle mass; restricting carbohydrate is the clear winner over all other diets in producing this result. Low-Carbohydrate Diets Promote a More Favorable Body Composition Than Low-Fat Diets. Jeff S. Volek, PhD, RD, Erin E. Quann, PhD, RD, and Cassandra E. Forsythe, PhD, RD Department of Kinesiology, University of Connecticut, Storrs, Connecticut. I just lose more fat on low carb – period! I’ve done it enough times to tell the difference. And it’s easier to do. So I would definitely back this up. My body composition improves from cycling my carbs. I love it! I don’t know about an advantage calories-wise, because I have never been that strict with calories. Thanks for the write-up. Thanks Mark! Absolutely wonderful research. Everybody reading this please click on Jeff Volek’s article–you won’t be sorry. Insulin physiology and all of its glory explained. You will have a MUCH better idea of what’s going on inside your body after reading and highlighting some of his major conclusions. And Mark, this reference article came to me just in the nick of time–I’m engaged in some “friendly” back-and-forth discussions with a Registered Dietician from an HMO who is trying to defend the more conventional dietary guidelines which all of us here know DO NOT work and DO NOTHING to help the average person lose fat. I’m simply trying to point out to her that the standard low-fat approach to weight loss which the HMO advocates is virtually worthless and is actually unethical for any medical institution to offer its members/patients, and in the meantime she’s defending the status quo stating that a Paleo/LC/VLC/higher protein approach is “unproven” or potentially dangerous, citing Dean Ornish of all people as a bastion of light…….Jeff Volek’s article is exactly what I was looking for, and addresses all of her concerns point by point. Perfect. I’m forwarding it to her, with comments. Read the following thoroughly before you fight a dietitian with Volek’s work. While it’s good and he is certainly a pioneer, there are a few holes that need to be filled for accuracy. Aragon’s debate should do some justice. I also agree with you that the average low-fat guidelines are less than optimum, but there is also a degree of genetic variation that comes into play. I’ve put clients on VLC diets with some serious compliance and food diaries (I know I know…not perfect), and the results were less than stellar. Macro ratio’s are a fickle thing. I like you, tend to do much better with lower carb diets, but my wife who eats almost identical to myself, needs a bit more carbohydrate for optimal results…. good luck with your debate. Mark, were the diets also isonitrogenous? Thanks for the tip. Just read the post, it was cool. Useful and enjoyed it. I have a better visual now of Volek’s work, and still respect it though I know there are variables involved with every one of us that’s different than the guy (or gal) standing next to you in regards to carb amount and cycling, high, low, timing, activity, genetics, etc. Will do a little more reading. My main gripe with the dietician was that THEY as a huge organization are essentially using the one-size-fits-all low-fat, high carb approach on everybody regardless of gender, age, weight, activity level, family history, etc. This isn’t proper either, although maybe the corporate lawyers have told them not to do anything else controversial or unconventional, or it’s trouble. That’s a consideration. I’m not really trying to push the issue of comparing highly trained athletes and their efficiency of using ketodiets with varying mixes of carbs for endurance levels and bursts of speed (like in the debate), to this HMO RD, but rather I’m just trying to get her to concede that the standard issuance of their own model of low-fat high-carb, “just cut down on sugar, eat more fruits and veggies and whole grains and you’ll be fine!” is not adequate for sustainable fat loss for the average couch potato or soccer mom, and especially their children, because it’s doomed to failure. Probably shouldn’t waste much time on it though. Doubt that she will concede anything–what spurred me on was that I got an email encouraging everybody to contact them for information on Diabetes/Obesity prevention and treatment……it’s such a waste to see so much PREVENTABLE human suffering in society today. Just look around you at all the walking energy bombs that you see every day. Bombs that will never go off. BTW, this is mean, perhaps very mean, but maybe we could solve all of our energy problems by legislating that from this point on, all deceased persons containing over a certain percentage of bodyfat MUST be cremated…..at special energy-conserving furnaces which would harvest all those dormant calories and put them to good use? Let’s do the math…..if someone’s 50-100 pounds overfat, let’s see, that’s 175,000 kcal to 350,000 kcal of potential energy that’s just been dormant for years, in fact it’s been causing particular drains on society and our energy by requiring more gasoline, jet fuel, bus diesel, to haul it around everywhere, and more cooking fires to prepare excessive food and to maintain said surplus….for years, maybe it could finally be harvested and put to use? Just kidding, but it IS Halloween coming up, so, it’s food for thought. Maybe a spooky idea for a twisted movie? If somebody steals the idea I want a cut. Actually, it’s not bad, kind of like Soylent Green. Uh oh, I’m dating myself. @JD. The first study referenced? No I don’t believe they were.